Dreadnought's armor scheme was surprisingly close to that of her immediate pre-dreadnought predecessors of the Lord Nelson class, and was in fact the only area where no great advance was made. This was partially because a major increase in protection would have been prohibitively costly, and partially because the Lord Nelsons themselves marked a significant improvement in armor, as the abolition of the 6" battery allowed much of the side armor, designed to protect the QF guns, to be eliminated. 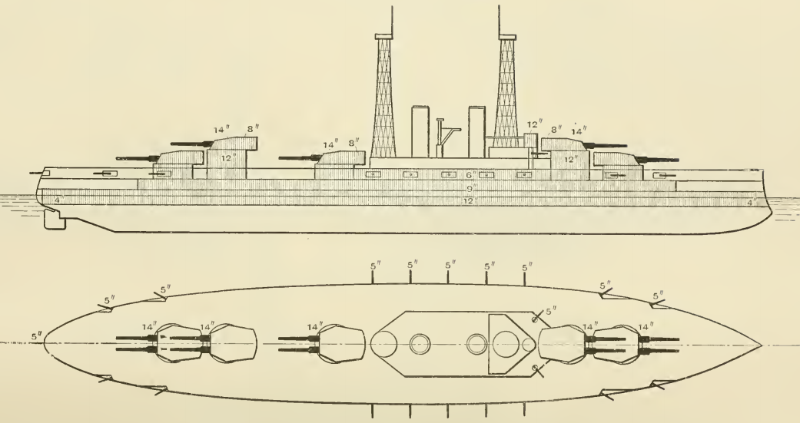 Dreadnought's armor scheme (above) and a section view (below). Due to the increasing power of guns, the area over which designers could provide adequate armor to keep shells out entirely was decreasing. It was concentrated in a thick lower belt near the waterline (11"/279 mm on Dreadnought), to stop shells from holing the ship in areas where adequate compartmentalization could not be provided, such as engines and magazines. To keep shells from going over the top of this belt, naval architects would provide a thinner upper belt (here 8"/203 mm), which would keep out light shells and set off heavy ones. The splinters from the heavy shells would be kept out of the vitals by an armored deck (1.75"/43 mm). Often, the edges of the armored deck were sloped down to meet the bottom of the belt, reinforcing it in case of penetration. 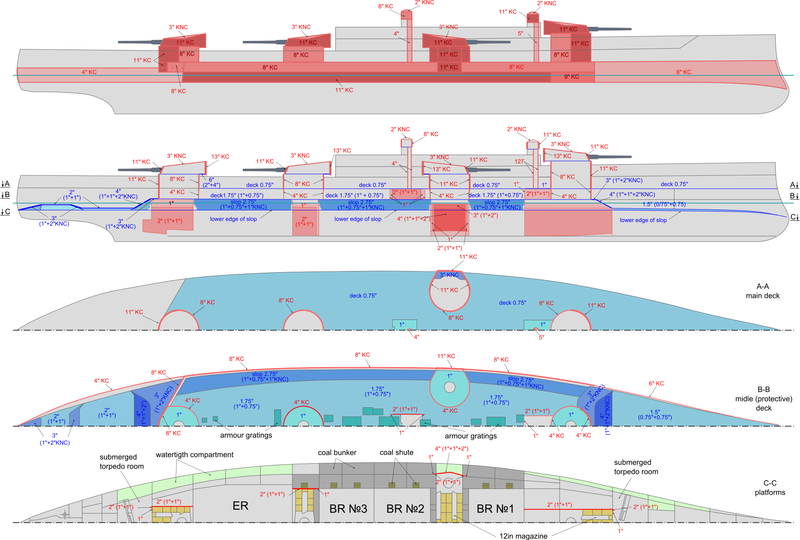 Sometimes, an upper splinter deck was placed over the top of the upper belt, in case the ship took hits at long range, or when rolling enough to make the main armored deck vulnerable. The limitations of contemporary shells played into these choices. When Dreadnought was designed, armor-piercing shells were mostly solid, as no effective delay fuse had yet been developed. Most guns fired various common or high-capacity shells, loaded with black powder or lyddite. These shells might be able to pierce as much as 1 caliber of armor, but they would detonate immediately thereafter. Capped AP shells with delay fuses were developed very shortly after Dreadnought was designed, although it took a few years for their impact to be fully apparent. In the meantime, many believed that ships would be disabled by non-piercing explosive shells and then finished off by AP at close range,1 so large areas were fitted with thin splinter armor, most notably the bow and stern. 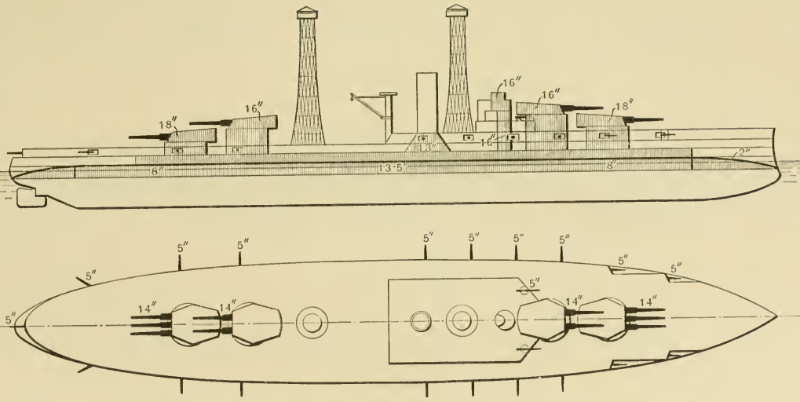 The US used a similar system on its early dreadnoughts. 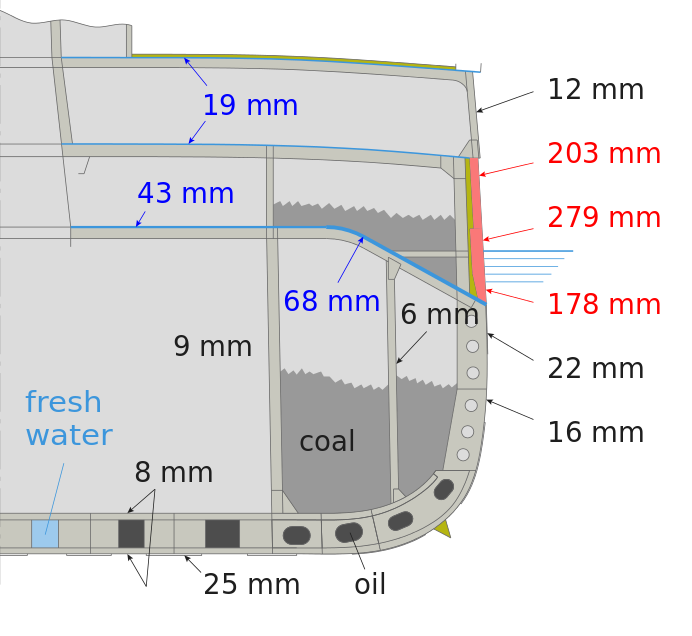 However, in an attempt to provide more protection to the secondary battery, the upper belt was extended into a full casemate, and no upper armored deck was fitted.2 The concept was that even shells falling at relatively steep angles would strike the casemate and be set off before reaching the armored deck. The US also provided much greater protection to the uptakes (boiler exhaust) than other powers did. Damage to the uptakes can result in loss of draft to the boilers, seriously reducing the ship's power. The uptake protection also prevented splinters from AP hits on one side destroying the secondary batteries on the other. Deck Weight (tons) 4796 5155 ? As is obvious from this table, the much greater area of the deck (as a rule of thumb, 6 times that of the belt) means that it has to be thinner, although the ratio of deck to belt climbed throughout the battleship era. 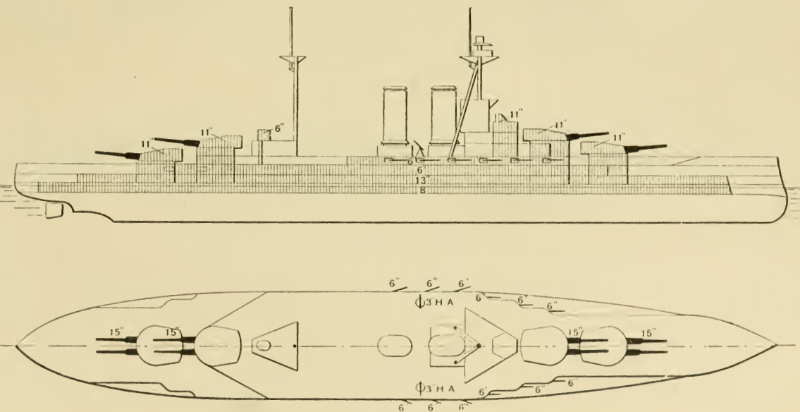 In the first US dreadnoughts, the South Carolina class, the deck was approximately 25% of the belt's weight, while the complete horizontal protection had reached about 70% of belt weight in Iowa. This was not entirely the result of increased combat ranges, though. Next time, I'll examine Iowa's protective scheme in detail, and look at the various threats and how they impacted the design of the treaty battleships. "Capped AP shells with delay fuses were developed very shortly after Dreadnought was designed, although it took a few years for their impact to be fully apparent"
I think I noted this on SSC once upon a time, but almost no real dreadnought battles, in either World War, were decided by fire at 20,000 yards or beyond. Individual hits were scored out to 26,000 yards or so, but only under exceptional circumstances and almost never with decisive effect. The practical limitations of visibility, fire control, and what passed for radar, meant decisive engagements were fought almost entirely inside of the "immune zone" as classically conceived, where there was little hope of any reasonable armor belt actually stopping a direct hit by a properly-functioning battleship-caliber AP shell. If that is the case, how would you go about modifying the armor scheme? Seriously, I'm not sure. It depends heavily on how much I can steal from the deck without you yelling at me for leaving the ship vulnerable to bombs. I'd look at what I could do to protect against damage from small-caliber hits, which were pretty common at shorter ranges. There may not be too much you can do, beyond duplication and spreading out important functions. All that said, I'm really not sure how much of the lack of long-range battles we saw during WWII was necessary, as opposed to chance. The longest-range engagement I'm aware of, during the sweep around Truk, saw a straddle on the first salvo at 37,500 yards. Also, armor is generally planned against the worst-case scenario. An immune zone for a battleship is planned against a 90-degree target angle. If that's not the case, then the inner edge can move in, maybe quite a bit. Can't say how much offhand. I'm on the road, so I don't have my books to hand, and a quick Google isn't turning up anything. But I'm not aware of any battleship actually sunk by gunfire alone. Bismarck and Yamashiro (Fuso was sunk earlier by torpedoes) were both torpedoed before they were sunk. Bismarck may also have had scuttling charges set off. Gunfire is very good at disabling ships, but not nearly so good at sinking them. You could argue that compartmentalization and duplication and light armor would do the trick. Not sure how strong the argument would be, and people keep handing me absurdly long wishlists of other things to write about. Hmm. That suggests considering a battleship designed to be nigh-invulnerable to fire from within e.g. 30 degrees of the bow, heavy forward armament (maybe A & B + 2 wing turrents), and a fervent hope that this will decide the fight before the range closes to a point-blank melee. Considering it, I think torpedo-armed destroyers make this pretty much suicidal, and if you're using the dreadnought recipe at all you're stuck with engagements on near-parallel tracks to make use of the superior long-range performance of battleship guns. I am going to stick with my thesis that internal toughness counts for more than external impenetrability. Besides the obvious problems, that's not quite what I meant. Cruisers were designed with a 60 degree target angle for their immune zones, while battleships were designed for 90 deg, because of how each was expected to fight. If the enemy column is on a parallel course, but ahead of or behind you, your target angle is going to be different. Theoretically, your best angle is about 45 deg, maybe a bit different if you have a different belt and bulkhead. WoWs appears to have adopted this kind of tactics, although I suspect this is due to the way the game is played. Considering it, I think torpedo-armed destroyers make this pretty much suicidal, and if you're using the dreadnought recipe at all you're stuck with engagements on near-parallel tracks to make use of the superior long-range performance of battleship guns. With you on the destroyers making it a bad idea. I don't have target angle data on everyone, but eyeballing charts of Jutland there were quite a few times when it was pretty far from 90. I am going to stick with my thesis that internal toughness counts for more than external impenetrability. And I'm certainly not saying it's a bad thesis. But doing a really proper evaluation is something that I don't have the time for. Most guns fired various common or high-capacity shells, loaded with black powder or lyddite. Black powder as late as 1905? I must say I find this rather surprising; I thought the various chemical advances of the 1880s and 1890s were so obviously superior that black powder went out of use almost instantly - at least in the major powers. Do you have any insight into the tradeoffs that led to this literally medieval explosive being still in use into the Dreadnought era? I don't know the full story offhand, particularly as I'm not an expert in explosives development at the time. They had a hard time finding a high explosive that would be stable enough not to be set off by the shock of firing or on impact. Black powder was apparently the best they could do there until TNT entered use around 1905. The USN chose Dunnite instead, but that seemed to work well, too. Black powder also had the advantage of leaving large, slow splinters, as opposed to the small, fast ones of lyddite. Sometimes, that's helpful because it gives you better penetration through light armor. It also had a nice incendiary effect. Rolf: Also worth pointing out that here we're talking about shell filling, not propellant. I assume we were on cordite by 1905 for the actual propellant (right Bean?) I know by WW1 we were, hence some fun explosions in the BCs at Jutland. That's correct. The first guns specifically intended to fire cordite were the 12"/35 Mk VIII introduced on the Majestic class in the early 1890s, although I believe some earlier guns were modified to do so.